Follow these steps to help you remove the bloat ware the comes pre-installed with Windows 10. Re-installed app is available without restart of the PC! Finally, here is a script (not made be us that works wonders. Again we take no credit for this awesome Start-Cleanup. Simply manage your studio, salon or clinic’s calendar in WordPress – whether you’re a private practice or spread across multiple locations. Appointments + automates your schedule and lets clients book online and reserve their spot with a deposit. Features that rival the most sophisticated – and much more expensive – booking platforms. Follow the instructions below to install and configure your new theme. Divi is a unique theme in our collection. Differing from every other Elegant Theme, Divi is built on a page builder platform that we designed and developed from the ground up. Using Divi’s drag and drop builder you can create beautiful layouts with ease and control over every part of your site. The most basic and largest building blocks used in designing layouts with Divi are Sections. These are used to create the top-level areas in your website.There are two types of sections: Regular, and Full Width. Regular Sections are made up of column rows and Full Width Sections are made up of full width modules. See more about rows and modules below. Rows sit inside of Sections and you can place any number of rows in a section. There are many different Row Types to choose from. Once you define a Row Type, you can then place modules into the selected column structure. There is no limit to the number of modules you can place within a column. Modules are the visual elements that make up your website. Every modules that Divi has can fit into any column width and they are all full responsive. Upon creating a new page, you will see the standard WordPress Pages window. When you are using Divi, you will see a [Use page Builder] button in blue. Clicking this will enable the Divi Builder and you will be Presented with with the Builder Start screen. NOTE: If you have existing page content, it will all be placed into a full width Text Module by default. If you would like to separate out the content into respective modules, you will need to manually place it into individual modules. At any time you can save a layout. This option is great for using a layout for another page, section of a page, or even another website built with Divi. See Saving and Loading Custom Layouts. You can also load a layout at any time. When loading a layout you have the option to select from an array of premade Divi Layouts or any layouts that you have saved/imported.. See Using Premade Layouts and Saving and Loading Custom Layouts. If at anytime you feel the need to start from scratch, just click the Clear Layout button. Sometimes you just need a fresh start. What you see below these three buttons is a Regular Section with a Row inside of it prompting you to insert a column layout. If you would like to start with a Full Width Section, select the ‘Add Fullwidth Section’ option from the bottom of the screen. Every time you add a section you will need to define its properties. By clicking the section menu icon at the top of the blue side panel you will be taken to the Section Settings. Section background images span the width of the browser so we recommend that your background images are at least 1080px wide. Background Color – If you would simply like to use a solid color background for your section, use the color picker to define a background color. Background Video MP4 – All videos should be uploaded in both .MP4 .WEBM formats to ensure maximum compatibility in all browsers. Upload the .MP4 version here. Video backgrounds are disabled from mobile devices. Instead, your background image will be used. For this reason, you should define both a background image and a background video to ensure best results. Important Note: In order for the MP4 video format to work in all browsers, your server must have the correct MIME types designated. You can learn more about using .htaccess to define MIME types here. If you notice your videos are not playing in certain browsers, then this is likely the reason. Background Video WEBM – All videos should be uploaded in both .MP4 .WEBM formats to ensure maximum compatibility in all browsers. Upload the .WEBM versions here. Video backgrounds are disabled from mobile devices. Instead, your background image will be used. For this reason, you should define both a background image and a background video to ensure best results. Important Note: In order for the WEBM video format to work in all browsers, your server must have the correct MIME types designated. You can learn more about using .htaccess to define MIME types here. If you notice your videos are not playing in certain browsers, then this is likely the reason. Background Video Width – In order for videos to be sized correctly, you must input the exact width (in pixels) of your video here. Background Video Height – In order for videos to be sized correctly, you must input the exact height (in pixels) of your video here. Inner Shadow – Here you can select whether or not your section has an inner shadow. This can look great when you have colored backgrounds or background images. After saving your section settings you will need to insert a row and define the row type. By clicking ‘Insert Columns’ you will be able to choose from a selection of row types. Once you have selected a row type, you will be prompted to insert modules into that row. In the example below, we added a two column row. Every Time you want to insert a module, you will need click ‘Insert Module’ and select one from the Divi module list. Once you have selected a module you will be brought to that modules specific options modal. See ‘The Modules; Section’ on our Readme Page. In the example below, we have filled the two columns with an image module and a text module. You now have successfully defined a Section, with a Row, with Modules in a two column row type. You can access any of the elements’ options by clicking its menu icon or deleting it by clicking the X icon. To expand your layout you can either choose to add a section to the page, a row to an existing section, or a module to an existing column. Below each section you have the option to ‘Add Section/Add Fullwidth Section’. Full width sections are unique in that they do not have rows. Because of this, only full width modules will work inside of this type of section. Full width sections are visually defined by a purple side panel and can be placed anywhere in your layout. In the Example below, we have added a full with section, with a full width Slider to our design. Editing your layout is very easy using the drag and drop builder features. If you want to move a section above or below another, simple drag and drop it in the desired location. Same goes for rows and modules. You can even move rows to different sections and modules to different columns. The only limitation to this is that you cannot drag Full Width Modules into regular sections and you cannot drag regular modules into Full Width Sections. NOTE: You cannot modify an existing row’s column structure, but you can create another row with the desired columns and drag existing modules into your new row. In the example below, you can see that moved our full width section to the top of our layout and added a regular section with a three column row in between our existing sections. We even added a divider module above our text for vertical alignment. Once you have finished building your layout, be use to click the Update/Publish button in your WordPress Dashboard. You will love the results. This video will teach you how to manage updates in WordPress. Keeping WordPress up-to-date is not only a great way to gain access to all of the latest WordPress features, it is also an essential part of maintaining a secure website. A banner appears in the WordPress Dashboard when updates are available. If you are a part of a WordPress MultiSite network, ‘Updates’ are the responsibility of the ‘Network Administrator’. A multisite is represented by a key icon next to the site title located at the top of the WordPress dashboard. 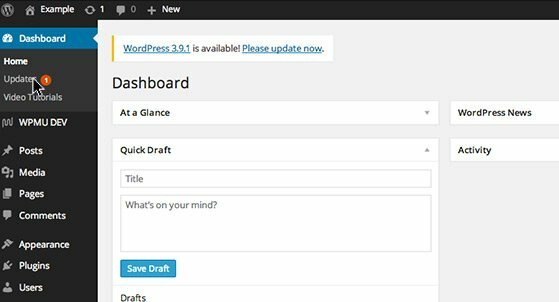 When a WordPress update is available, an update banner will appear in the dashboard. You can click on the banner to take you to the available updates or click the ‘Updates’ link in the ‘Dashboard’ menu. Before running updates it is a good idea to back up your site. There are a lot of free and paid pluginsavailable for backing up your site and even third-party services that will run automatic backups for you. For more information on backing up your site you can visit the WordPress repository and the ‘Updating WordPress Codex‘ page. Back up your site before running an update. Once your site is backed up, and you’re prepared to update your site, click on the ‘Update Now’ button. When your update is done you will be automatically directed back to the WordPress dashboard letting you know that your site is ready for use. Be sure to test your site to make sure everything is working as it should. Introduction to using and managing WordPress ‘Settings’. 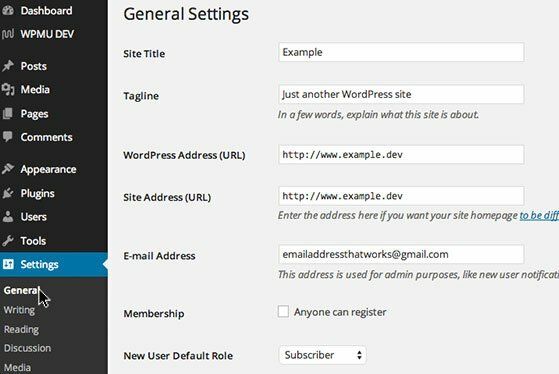 The ‘Settings’ menu is used to configure your WordPress install, from the ‘Title’ and ‘Tagline’ to how permalinks are structured. The ‘Settings’ options change the way search engines, site users and you interact with and manage the content on your site. The ‘General’ tab under settings lets you configure some of the most basic settings in WordPress–your ‘Site Title’ and ‘Tagline’, the WordPress and site URL, The site admin email address, if the site should have open registration and how dates and times appear on your site. ‘General Settings’ is used to configure some of the most basic WordPress settings. The ‘Writing’ screen is for controlling how post content should display by default. These settings include emoticon conversion, what ‘Default Post Category’ to use, how a post should be formatted, the ‘Press This’ bookmark and ‘Post via e-mail’ settings. ‘Reading’ is where you can set if a page or a list of posts should display on your home page. It also gives options for how many posts should display on your blog–as well as other feeds, if it should show the full post or just a summary and whether or not you want people to discover your site on search engines like Google. The ‘Discussion’ screen sets how your site manages posts that get shared on other sites and comments. This includes pingback and trackback settings, comment moderation settings, comment notifications and Avatar display options. 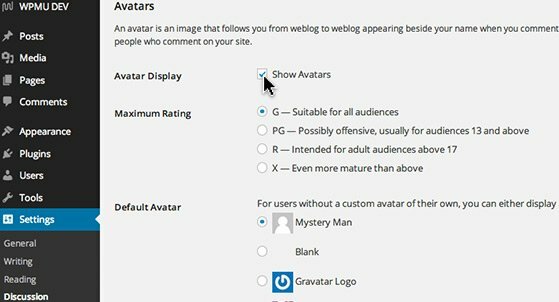 Adjust how avatars display for a more interactive user experience. ‘Media Settings’ gives options for choosing what sizes to convert images to when uploading them to the media library and if uploaded images should be organized into month and year based folders on your server. The ‘Permalink’ settings allow you to create a custom URL structure for permalinks and archives. This can improve the aesthetics, usability and forward compatibility of your links displayed in the browser. This video will introduce you to the ‘Tools’ menu in WordPress. The ‘Tools’ button in the WordPress dashboard gives options for quickly sharing information from your web browser, importing content from other sites (WordPress or otherwise), and exporting the content on your site–as a backup or for moving to another site. ‘Press This’ is a bookmark that you can add to your browser as a quick way of making posts out of content you come across on other sites. When you click on the ‘Press This’ link it creates a post with the title pre-filled for you and a link to the page you are visiting in the body of your post. You can add your own information, edit and change the content and publish the post immediately or just save it as a draft for future use. ‘Press This’ helps you quickly generate a post from content you want to share from another site. 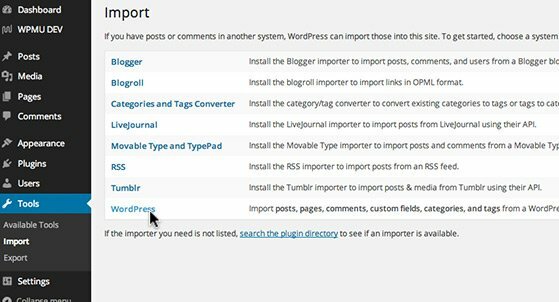 The ‘Import’ screen provides a list of tools for importing posts or comments from sites using WordPress and other systems. To help keep WordPress running quickly these tools should be installed as needed. To install one of the import tools, click on the name of the tool you would like to install. Import content from WordPress sites or other systems. The ‘Export’ feature is a tool for exporting the posts or pages on your site individually or to back up your entire database–including posts, pages, comments, custom fields, terms, navigation menus and custom posts. The ‘Download Export File’ button will create an XML file you can save as a content backup or to move the content from your existing site to a new site.